Software Suite is a collection of two or more programs/applications sold in one package. Often they share related interface, functionality and theme; if not then it is easy to exchange data among one another without hassles of formatting and interoperability. The simplest example is Microsoft Windows Office – as it keeps collection of Word, Excel, PowerPoint, and Outlook. They differ in functionality but come together and are vital for office productivity. A software suite is known by other names as well, such as Productivity Suite, Application Suite, or Utility Suite. Applications falling under the purview of software suite are known for compatibility and integration. Though simple copy-and-paste activity is rather a simple-looking task, but doing it between different (non-integrated) applications or software causes problems in formatting and symbol acclimatization. For example, importing data from Access database to Excel Spreadsheet can be achieved without hassles. Next, the Excel data can be forwarded into Word for emailing or PowerPoint presentation. The same can be said about importing data and digital files, where one fears losing data and content in the process. Well under software suite applications, moving is simpler. They are designed in such a way. The cost factor is always a matter of consideration while availing IT-related services. Applications under suite are always cheap as compared to buying applications one on one. 1. Microsoft Office: it is offered by Microsoft in Windows operating systems. Once you install any Windows operating system on your computer, you get this, but we cannot say it is totally free. It consists of many important elements that are essential for office or basic day to day productivity. It consists of Word, Excel, PowerPoint and a few more items. 2. 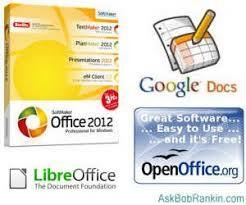 Google Docs: it is quite famous and we and you use it probably on daily basis. Here you can avail the services of Sheets, Docs, Slides, and Forms. It is a web-based facility and can be accessed by email id and it gets stored on cloud. It’s free. 3. Adobe Creative Cloud: a very useful for graphic designers and video makers and editors and publishers. Rather a great suit for visual things. It consists of Dreamweaver, InDesign, Photoshop, Illustrator, Acrobat Pro and some other useful supporting tools. It is a cloud based paid service. 4. Apache OpenOffice: this open source productive suite is available for free and can used by anyone. Its USP is that it supports many languages. You may use it for database application, formula editor, spreadsheet and writing in word and so on. As a matter of fact, it resembles Microsoft Office in functionalities and is considered a rival of it. 5. LibreOffice: it is an open source free service. Its products are designed to replace Microsoft Office, like it consists of Calc, Impress, Writer, Draw and Base. Unlike MS Office, it works fine with Linux and documents created on it can be used decades later as it does not release pesky updates anytime, like Microsoft.